Here’s another find – this one’s from 2009 and was recovered during monitoring of excavation works for a park and ride facility at NUI, Galway. Archaeological monitoring at the development site exposed no features of archaeological significance. 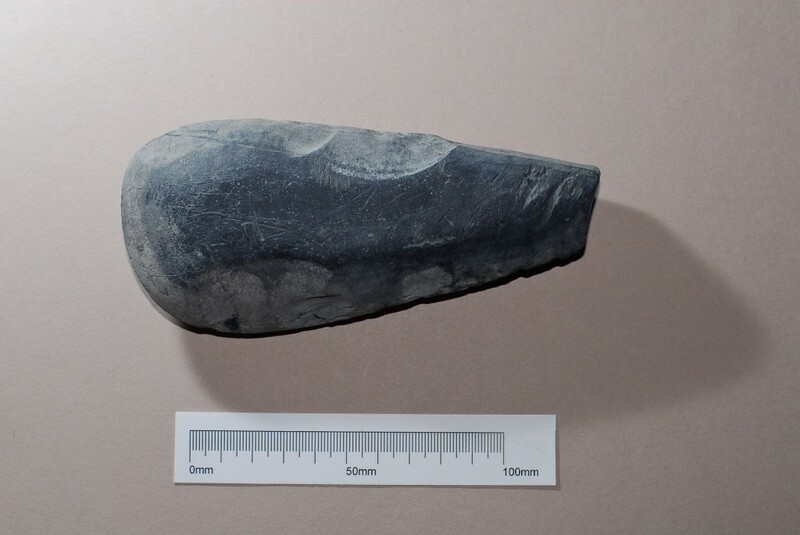 However the stray find of a Neolithic polished stone axehead recovered from up-cast material from a service trench to the South West attests to the previous activity. The numerous finds ranging in date from the Prehistoric period to Medieval times recovered from within and along the banks of the River Corrib demonstrate the importance of the river as a navigable route providing access to the islands of Lough Corrib and the surrounding hinterland. Moreover the finds location to the north of a known fording point at Jordans Island indicates the strategic importance of this general area. The river Corrib has been described as a short river with a long history. The river drains Lough Corrib, the largest lake in Ireland, and flows south-eastwards for a distance of 6km to the sea. The river was forded rather than being crossed by boat below Menlough Castle in prehistoric times. The river was also forded at Jordan’s island from Viking days and at the site of the Salmon Weir Bridge from medieval times (Spellissy 1997, 91). An area south of Menlough near the graveyard, known locally as ‘the Tail of the Woods’, has produced much evidence of early human activity in the area. Hundreds of stone implements dating from the late Mesolithic and the early Neolithic have been found in the river Corrib and on its banks in the area between Terryland castle and Menlough castle. The finds included various types of blades, as well as Bann flakes, hammer stones, and axe heads. Evidently, the river Corrib was an important resource for inhabitants of the area during the Mesolithic and Neolithic, which provided plentiful fishing, foraging and hunting. There is some evidence for ritual deposition in the River Corrib during the Bronze Age. During the 1980’s, three bronze spear heads were found in a deep section of the river, opposite the entrance to the lakes of Coolough. They were found close together which suggests that they were possibly votive offerings, (ibid. 56). During the Iron Age and the early historic period, the area continued to be prime settlement area, evidenced by the ringforts and cashels, which were built on the banks of the Corrib River. 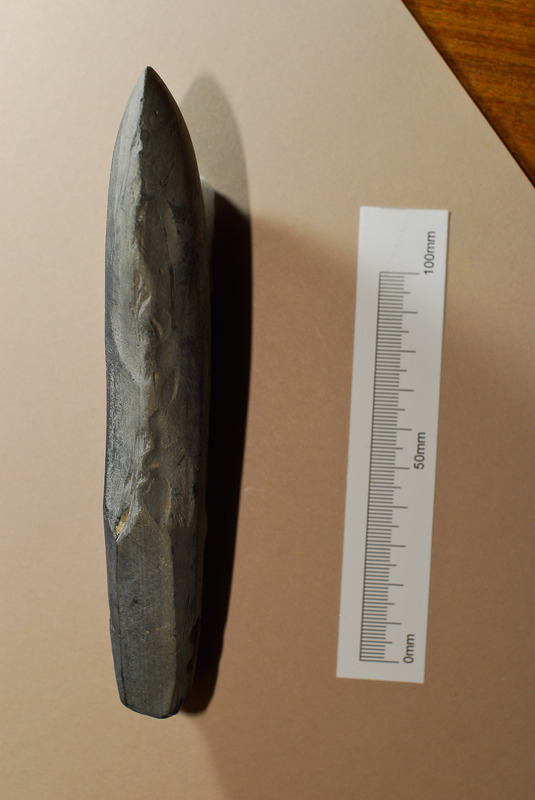 A La Tene sword was also found near Jordan’s Island, a sign of Iron Age activity in the general area. Viking type swords have also been found near Jordan’s Island. The annals record that Vikings plundered the islands of Lough Corrib in 927 AD, presumably by navigating the River Corrib at full tide. Another reference in the Annals is to the Earl of Thomond crossing the fording point at Jordan’s Island in 1560 AD. Reference: Spellissy, S., 1997. The History of Galway. This entry was posted on Friday, April 15th, 2011 at 3:27 pm. It is filed under About Archaeology, Finds, Virtual Museum and tagged with Archaeologist, Artefacts, axe, finds, galway, neolithic, polished stone axehead. You can follow any responses to this entry through the RSS 2.0 feed.